1. If loading rules are being used in the SHOTPlus™ file, it is possible to re-apply the loading rules from the main tool bar. Select the drop-down arrow on the Loading Tool in the tool bar. Select the option to reapply. 2. 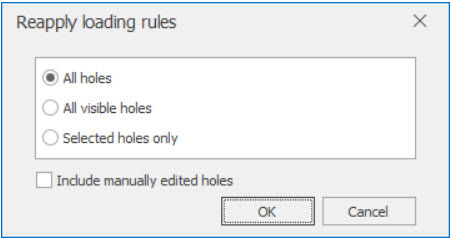 Select the appropriate option to either reapply rules to All holes, All visible holes or Selected holes only. An option to include manually edited holes has been included in the dialogue box. This is not selected by default to protect manually edited loading designs. 3. The functionality to click on the Loading Tool and Empty/Apply loading rules has been maintained. 1. Previously, Manually loaded holes were impacted by the reapplication of loading rules. Modifications have been made to exclude Manually loaded holes from the re-application of loading rules (unless a user chooses to include them in the re-application). 2. In order to adjust the length of a Manually loaded hole as dipped lengths become available, for holes that are longer than design, the original design will be preserved and a backfill deck will be added to the bottom of the hole, regardless of the backfill settings. For holes that are shorter than design, the variable deck will not adjust, instead the design will be maintained and the bottom deck will be adjusted.